When should I arrive and where should I go? Check-in times are organized based on the student's last name. At check-in, you will receive information about your schedule, instructors, and counselors for the week. Residence students will receive their room key, and students registered for a meal plan will receive their meal card. All final payments must be made at this time, if not already completed online. If you have finished registration before 6:00pm, this is a good time for parents to take their students for a final family meal before the week begins; if your registration time is closer to 6:00pm you may want to have the family meal before arriving. Please note that there is no supper provided on-campus Monday evening. Is there anything planned for Monday evening? There certainly is! After registration, a general information session will take place, followed by individual performances for band/combo/quartet placement. Beginners will also have their first class! We will then take a campus tour and participate in small and large group activities to get to know one another. Day students should be picked up at 9:00pm. What supplies do I need to bring to Acadia? All students need to bring their own instrument and accessories (include reeds, oil, mutes, etc. ), pencils and a small notebook. For those bringing reed instruments, it has been recommended that you select Rico-Royal clarinet and sax reeds: #2.5 for beginners and possibly first year players, #3 for first year and beyond. A clipboard will also prove handy. Percussionists should bring snare drumsticks, as many pair of various mallets as possible, and a practice pad or snare. Beginner Band percussionists should bring sticks and a practice pad. Make sure your instrument is in good condition before the academy begins, as there will be no instruments available should yours break. All students should bring sunscreen, a hat, an umbrella, swimwear, and a small amount of spending money, including coins for the vending machines. You may wish to consider bringing a Frisbee or football for use outside. High School students should bring solo material they would like to work on during camp. Do not leave any of your belongings or equipment unsupervised in an unsecured area or room. Acadia University will not be responsible for any lost, stolen or damaged articles for the duration of the academies. Please label all of your belongings and equipment! What kind of schedule will I have during the week? A busy one! Classes run from 8:25am-4:15pm, with an evening class for some students from 6:00-7:00pm (just before evening activities!). Be sure to consult your schedule daily and check with your counselor each day for any changes. There's a lot to do and you will receive a more complete schedule when you arrive at Acadia. Please note that the activities are for all students and we encourage day students to take part in as many events as possible to get the most out of the experience at Acadia. Activities vary each day/evening and may include outdoor sports, a movie night, a variety show, concerts, and a dance. Yes, you'll have free access to Acadia's WiFi network throughout the week, which is available in residence, Meal Hall, and all academic buildings. Who do my parents contact if they need to reach me while I'm at Acadia? Messages may be left for students at the Residence and Events Office by calling (902) 585-1221. This office is operational 24 hours a day. In the case of an emergency, call Acadia Campus Security at (902) 585-1103. The academy concludes with a final concert/showcase on the last day (Sunday, July 7th). Parents: please confirm the time and location during registration check-in. This event is open to family and friends. Students will be ready to leave following the concert. There is no formal dress code for this event. The final performance will take place on Sunday, July 7th. Before the band performances, various Chamber Ensembles will perform in the lobby. Parents, please check with your camper to find out if they are playing in one of these ensembles. All students are expected to stay for the entire performance. For residence students, check out from residence will occur after the concert. Day students may leave directly from Festival Theatre. Where will I be staying on-campus? The building(s) we will use in 2019 will be announced in April, but most of the details below will still be applicable. In 2018, we will be using Eaton House and Christofor Hall as our residences for students. Students who have been coming for a few years will remember staying in these buildings in 2015. Absolutely! Both residences have double rooms to accommodate this request. When you register online, be sure to include your friend's name(s) when the question is asked. What should I bring for my stay in residence? Bedding and pillows will be provided, but you should bring towels, face cloths, other personal items such as shampoo, soap, shower shoes, toothbrush, and toothpaste, some spending money (including change for vending machines), an alarm clock or watch, running shoes, sportswear, shorts, and a water bottle. There is no air-conditioning, so students with a small fan will be popular! Do not leave any of your belongings or equipment unsupervised in an unsecured area or room. Acadia University will not be responsible for any lost, stolen or damaged articles for the duration of the academies. Please label all of your belongings and equipment! How do I eat while in residence? Each residence student's room key is also their meal card. Acadia's Wheelock Dining Hall will provide you with breakfast, lunch, and dinner each day. Specific meal times have been arranged and are listed below. If you have specific food restrictions (allergies, sensitivities, etc. ), please clearly communicate them to us via the registration form or by contacting our offices to be sure we are aware of your needs. Our meal hall is very familiar with these types of requests, and will be sure alternatives are always available at each meal. Where can my parents drop me off and pick me up each day? All day campers must sign in and out each day. All campers should check in by 8:15am at the Festival Theatre Building (FTB) on Main Street each morning. All camp participants will start each day together in a session beginning at 8:30am sharp, so please arrive between 8:00am-8:25am. A counselor will be there to check you in. MYWE day campers will check out of Festival Theatre at the end of the day as well, but all other campers will check out at "Camp Central" in Christofor Hall. If you will be leaving campus on your own at the end of the day, you must provide permission from a parent (either written or communicated directly to a counselor) at the beginning of the week. You must still sign in and sign out whenever you arrive or leave campus. When you register, you can choose to enrol as a day camp student, or a day camp student with lunches included. If you choose the second option, we will provide you with a meal card at check-in and you will go to Wheelock Dining Hall for lunch each day. There are refrigerators in the residence lounges to store your lunch if you choose to bring it with you from home. Microwaves are also available. You may choose to purchase your lunch at the dining hall only a few times during the week, instead of a full week meal plan. This would be on a cash basis and is approximately $16.30, including tax. Day campers may also choose to make similar arrangements for supper on campus, since there will be evening activities. Can I participate in evening activities? Of course! Some students will have a band rehearsal from 6:00-7:00pm, but there will also be optional evening programming for all students until approximately 9:00pm each evening. Day students are welcome to go home at 4:15pm and return in time for the 6:00pm class if it's more convenient. Or, you can choose to purchase a meal at the dining hall, just as you would purchase a lunch. The schedule you will receive at check-in will provide more information on the evening activities, and your counselors will have updates as well. Each year, we welcome community band members to join us. 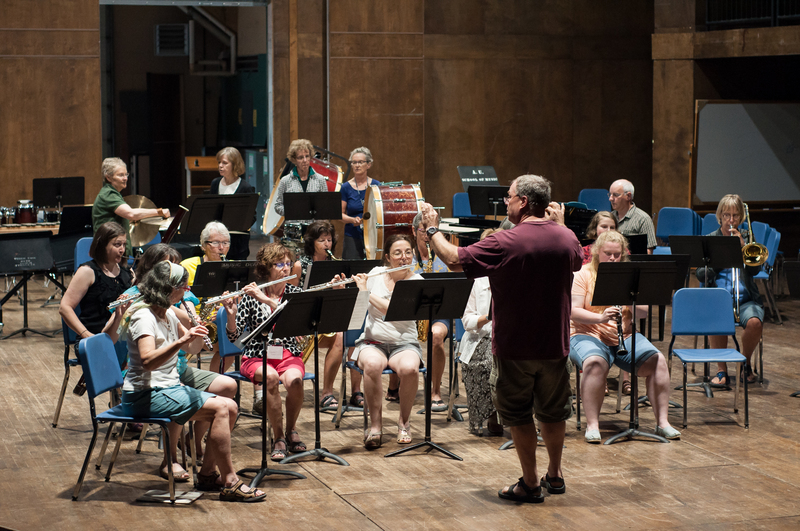 These participants are adults who have been playing with an organized community band such as New Horizons Band in the Annapolis Valley or Second Chances Community Band Program of NS and PEI. These players learn alongside our younger students at each level of band. They bring an added dimension of maturity and love of music that we feel is a very positive experience for our younger players. If you are a member of a community band and would like to participate, please submit your registration online at the link below (available in April 2019). The tuition fee for community band members is $175 which includes HST. If you choose to stay on-campus during the week, daily residence and meal plan fees will apply. The room fee is $26+tax/night. A breakfast-lunch-dinner meal plan at Wheelock Dining Hall is available for approximately $45/day if you choose that option when you reserve your room. Registration for residence and meals will be processed through the Acadia Box Office directly in June 2019. Please see below for contact information. This summer, community band members will be staying in Whitman House. Community band members will be asked to participate in the band placement process Monday evening. You should bring a piece of music to play for faculty members—select a piece that highlights your playing ability—and be prepared to play scales of your choice and to sight read a brief selection. If you are unable to attend Monday evening, please contact us so we can make arrangements for you to meet with your instrument instructor Tuesday morning for placement. If you have questions, please contact us at academies@acadiau.ca or at 1-800-565-6568 and we'll be happy to help. Camp registration is now available here. Residence Reservations via Acadia Box Office will be available in June 2019. To book a room in residence, please call 902-542-5500.